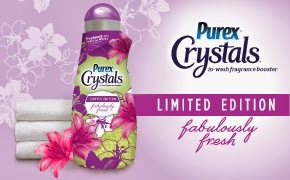 So Make your laundry day fabulous with Limited Edition Purex Crystals Fabulously Fresh. Enter for a chance to WIN a $1,000 shopping spree plus a year’s supply of Limited Edition Purex Crystals Fabulously Fresh. I love Purex Crystals and cant wait to try this scent its going to be a nice one for spring. be on the look out for it, it is a limited edition so It wont be around long.